Elaine Sexton: I understand you are a student at the New World School of the Arts and this is your final project for your BFA. I came across your text and image installation during a recent visit to the CIFO Art Space in Miami at Cisneros Fontanals Art Foundation. 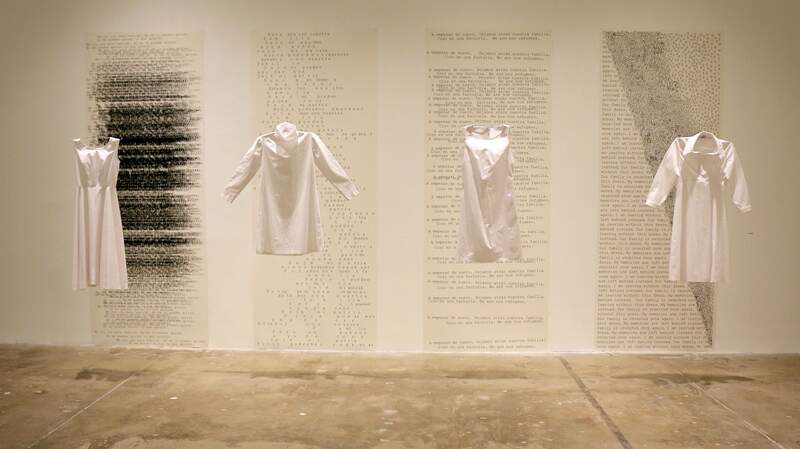 This striking installation is made up of four pristine white dresses suspended in front of text in large scale panels on the wall behind them. The tension between the text that reference garment factory work and the beauty of the dresses is palpable. Would you share the background for this beautiful body of work? 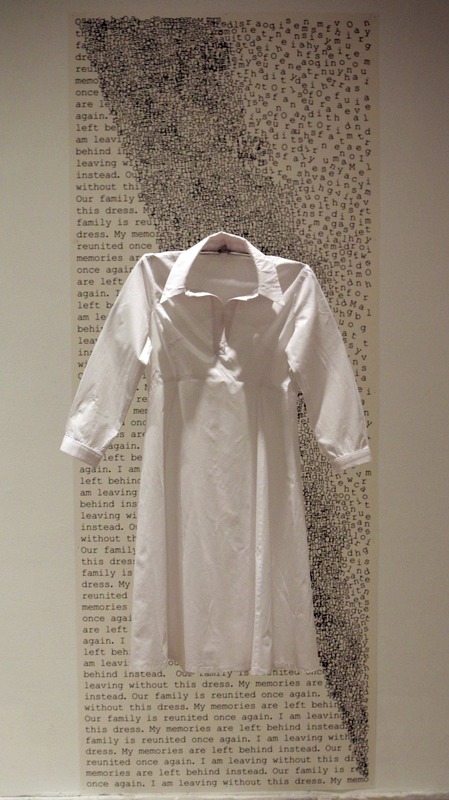 Monica Viada: Migration & Memory is an installation-based piece that visually represents the voyage and struggles of leaving a motherland and immigrating to a new country. I expressed the emotions and experiences with a typographic style referred to as concrete poetry. I wanted the typographical effect to be just as important as the poetry itself. The text on all four panels is transcribed text from stories that my grandmother shared with me while I was growing up. Since this work is based on a personal story within my family, I chose to focus on certain keywords and phrases that I found to be important to each period of her life. ES: Much of the text is barely discernable, but in the text that appears to be typed over and over, snippets of words come to the surface, for example, the word in Spanish quitar… to remove. In the catalog you quote from a poem by Rupi Kaur “our backs/tell the stories/no books have/the spine to/carry.” What is the connection? MV: The complete text on the first panel reads “My voy con este vestido. No me lo pueden quitar. No me pueden quitar lo que aprendí,” which translates to “I’m leaving with this dress. They can’t take it away from me. They can’t take away from me what I’ve learned.” I linked the image to Rupi Kaur’s poem because every person has such a unique experience that it’s almost impossible for someone to have the exact same story. This work is inspired by a personal story — the story of my grandparents’ journey to the United States from Cuba. When the Castro Revolution struck upon Cuba, my grandparents wanted to leave. My grandfather was punished by the Cuban government for stating that he wanted to leave Cuba, so they had no choice but to stay for a longer period of time. Shortly before 1970, my grandparents traveled to Spain because that’s the only place where they had family. The Spanish government treated them unfairly by not permitting them to work or receive any assistance. In 1974, my grandparents decided to leave Spain and move to the United States with their two young daughters (my mother and aunt). They came to the United States where they had no family, didn’t know a single word of English, and had very little work skills. My grandmother began working in a clothing factory and my grandfather worked in a gasoline station. Over time, my grandparents became very successful. My grandmother became a public school teacher and my grandfather became a businessman for many years. I was inspired by the struggle, effort, and result of my grandparents’ travel to the United States, because in the end they made something great out of themselves. ES: So, you are just completely your BFA in graphic design. What’s next? MV: I plan to pursue a career in graphic design. I have really appreciated the ability to merge graphic design with fine art, so I think I might look into making some custom installation-based pieces. Kind of like “visual design.” I’m considering doing my Masters degree in the future to become an educator. I would love to teach since it’s always been a dream of mine.